Another great chase day, and for the most part we were within 40 miles of our hotel the whole time. After sleeping in at our hotel near Denver airport, we met late and headed out for lunch as storms were already bubbling up in the foothills of the Rockies. By the time we got the group back together, one of those storms was already severe just south of Denver, so we headed towards Bennett to get set up, initially targeting a cell off to the south. We quickly elected to change targets to the storm near Denver, hopping back on I-70 towards Denver. We soon were driving directly towards a big, low hanging wall cloud and the chase was on by 2 PM local time, only a few miles from our hotel! We got off the highway just south southeast of Denver International Airport and made our first stop as the storm was already showing significant rotation and had that greenish glow of a storm with large hail. We began stair stepping on the roads to the east of the airport and soon the storm was tornado warned and had now developed a long tail cloud out of the wall cloud area. We repositioned one more time and when we stopped and set up the storm was now showing violent rotation and quickly produced a brief elephant trunk tornado! The tornado quickly changed to a multi-vortex tornado then got swallowed by the massive precipitation core. From that point we were never able to clearly see it again, but now there were several reports of a tornado along Tower Road (where our hotel was!) so we knew it was in there. The precipitation core kept getting larger and larger as we continued stair stepping northeast in front of the big high-precipitation storm. We let the core get right up to us a couple of times then pulled away to get a better view of the structure, all the while weaving in and out of the hundreds of storm chasers who were on the storm. When we got to Rt. 36 east of Byers, we were in a full blown traffic jam, mostly precipitated by the Doppler on Wheels crews crawling along the road. At this point the storm had cycled down, but by about 5 PM it was cycling back up and was again tornado warned so we headed north on county roads northwest of Last Chance to get in front of the updraft again. This unfortunately proved impossible as multiple cells were opening up all around us, turning the roads to mud and making any chance of seeing anything impossible. We aborted our chase and had a wild, muddy ride east trying to get back to the pavement, finally succeeding north of Last Chance. As we got back on Rt. 36 heading back to Byers, the fields off to our north were covered with hail. After stopping at a restaurant for dinner we returned to the hotel, curious to see if there was any damage. It turns out they had gotten EIGHT INCHES of hail! 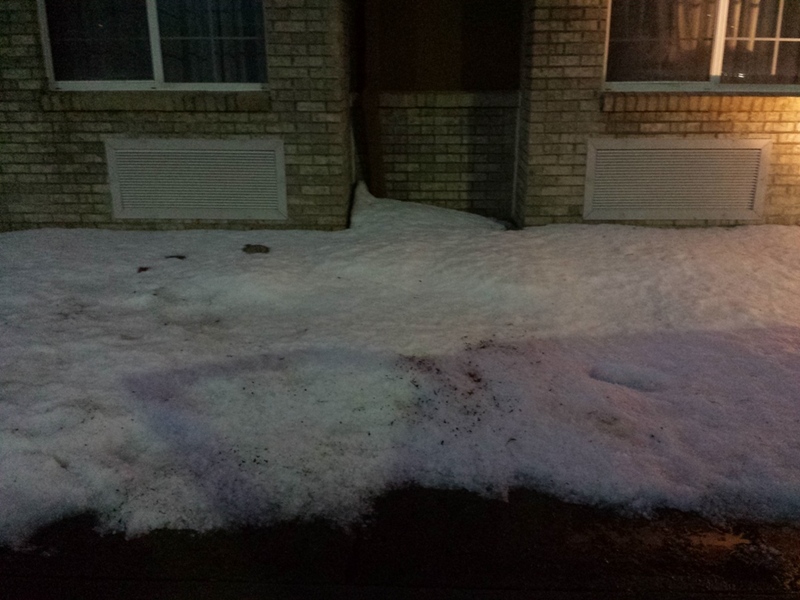 It was 6 hours after the storm, and hail was still piled everywhere. 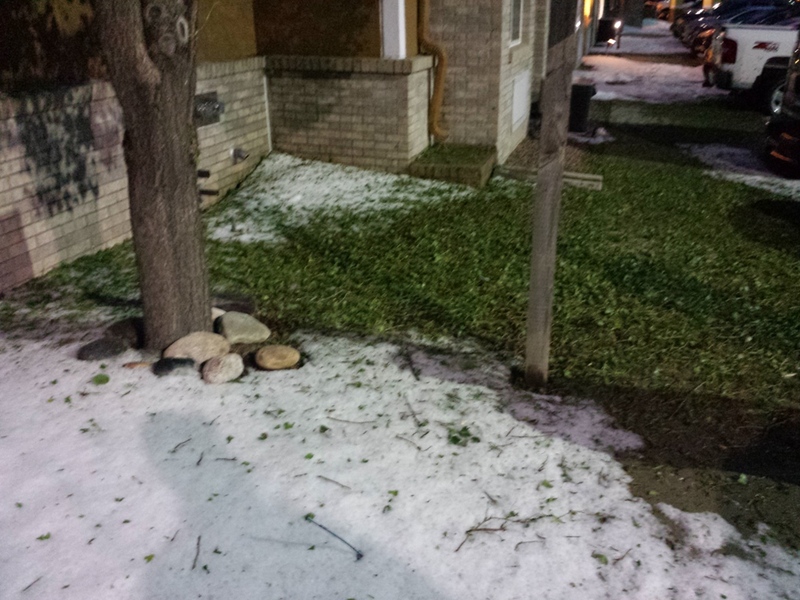 The trees were absolutely shredded and there were numerous cars pock-marked by the dime and quarter sized hail. There were rabbits everywhere loving the “instant salad” created by the hail shredding the trees, and the neon sign at the diner we stopped at for breakfast was shattered. Despite staying close to the hotel, by the time we’d finished we’d racked up 213 miles. Stopping for lunch near Denver Airport, storms had already formed in the mountains and become surface-based. Initially targeting a storm near Bennett, we reversed course and headed back towards Denver. On I-70 near Denver, the storm already had a low-hanging, rotating wall cloud. Heading north from the highway, we stop south of the airport and let the storm come to us. Close up of the wall cloud as it crossed I-70. Close up of the wall cloud as it crossed I-70. The gang deploys to film the storm! The storm was spinning like crazy and getting that turquoise hail glow. Big tail cloud on the leading edge of the wall cloud slurping in moist air. The storm transitioned to High-Precipitation very quickly. The storm is raining out of the base, usually a sign that the tornado threat is reduced. It was still rotating violently though. Small funnel at mid-level was a sign that there was a lot of shear. Lots of roiling under the updraft as the storm neared our position. The storm is an HP moose already!! Raggedy wall cloud remaining rain free for now. After seeing a brief elephant-trunk tornado that got engulfed by the precipitation core, what's in there?! There were reports of a rain-wrapped tornado at this point. The storm was right about over where our hotel was, and it was also time for us to get out of the way! 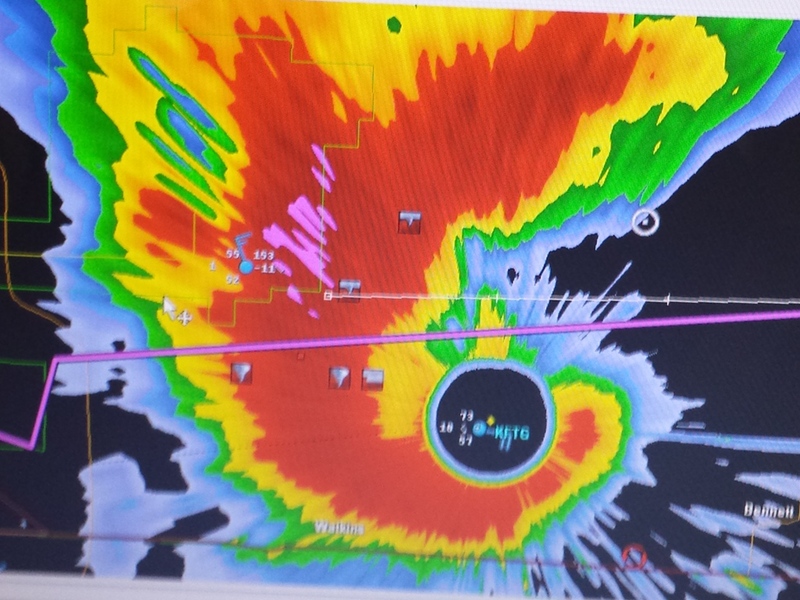 Radar shows the hook echo right over the airport and our position (white circle) just to the northeast. Stair-stepping northeast of the airport, the storm is a big hailer now. Crazy motion as low-hanging scud is sucked into the storm. The storm passing to our west, time to get moving again! Closing in.. The hook is occluding in this shot. It would be very difficult to see anything happening in there. 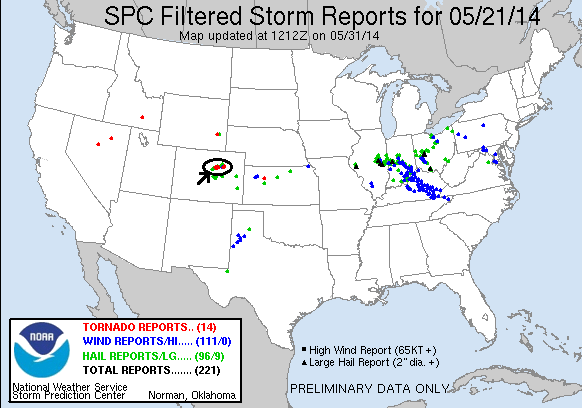 The storm was stringing out into multiple sells as it traveled northeast. This is what happens when you get too close to the edge of one of those muddy soft shoulders! Our original storm to our north with a big scud-bomb under the updraft. Closer look. The chaser-gaggle was in full force out on the plains east of the airport! The Doppler-on-Wheels (DoW) teams were out on this day! Heading back through Byers, huge hail swath in the fields to our north. 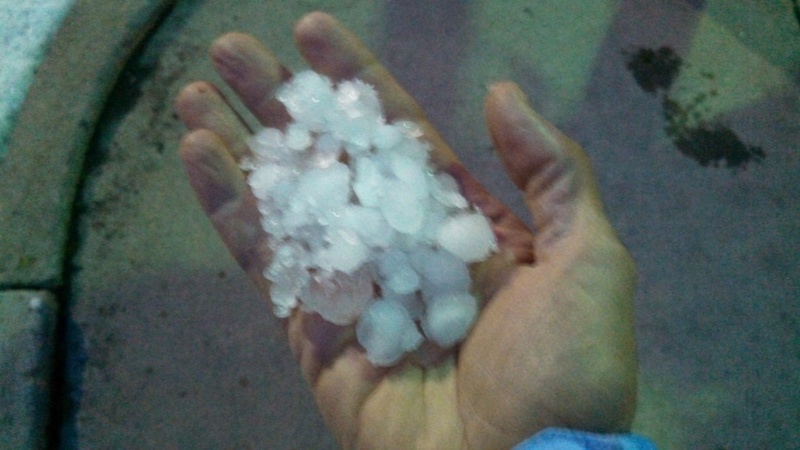 Some locations got EIGHT inches of hail from this storm! The plows were out as if it were a snow-removal situation. Back at the hotel there was still hail all over the place hours after the storm. The trees were absolutely shredded by the hail, and neon signs all over the place had been smashed. Tons of dime-sized hail still on the ground. The shredded leaves were a feast for the rabbits the following morning.